Easy and amazing results! Let's get started by selecting the ham. I choose to buy smaller cut and sliced pre cooked hams. Once you have your ham, coat it with yellow mustard. Then shake on McCormick's sweet & Smokey dry rub. Make sure to hit the sides and bottom as well. Once the rub is on then rub in some brown sugar. Again on top, sides and bottom. 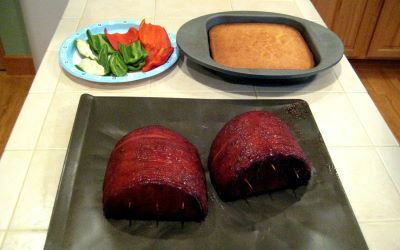 If you have a sliced ham as the one in the photos to the right, it helps to insert toothpicks to help hold it together. 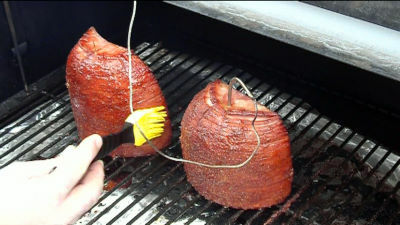 Place hams into the smoker @ 230 degrees. Mix 1/2 cup of hot apple juice and 1/4 cup of honey to make the Honey Glaze. 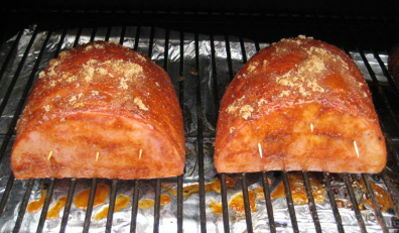 Once the ham reaches 140 degrees start mopping it with the honey glaze every 30 minutes. This is a good time to mix up some cornbread mix. Dump a 1/8 cup of honey in the cornbread mix and use butter instead of oil. It will rock! 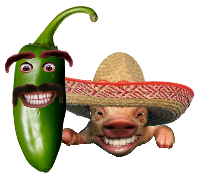 Also add some bell pepper and Jalapenos to the grill. 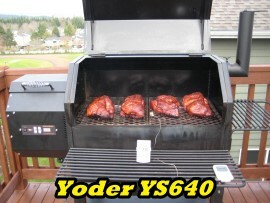 Smoke until the internal temperature reaches 150 degrees. Pull ham and peppers from the smoker. Let ham stand for 15 minutes.